Unless you’re getting a custom-fit leather suit, it’s quite easy for women to look frumpy in riding gear; leather or textile. Not that style should trump function, but if there’s a choice between something that is big and bulky or something that is form fitting and also protective, I’ll pick the latter. Enter the REV’IT Sand Ladies pants and jacket. It’s the successor to the Netherlands’ brand’s Ventura line and hugs the female form better than previously. That was the goal when designers went to create these pieces; still give all the protection you need atop two wheels but minimize bulk, streamline the pieces and make it look good. It also takes its DNA from the men’s Sand 2 gear, which has been wildly successful for REV’IT. The Ladies version of the Sand jacket has much the same construction as the men’s version. Without listing every aspect of these technical pieces – you can also click on my esteemed colleague’s review link here for more in-depth notes – following are a few facts that comprise the REV’IT’s ladies Sand jacket and pants. The pants and jacket were designed with 4-season riding in mind, and utilize 3-layer textile pieces with thermal inserts and hydratex waterproof liners – which are now a pretty standard way of providing waterproofing for textile suits, though not a popular method at CMG as they allow the suit to get soaked and are hard to install at the side of the road. The jacket is laced with seven vents, abrasion resistant materials, CE armour and five-position adjustable collar. You also have the choice in four different colour combinations: black-white, silver-blue, silver-black, and the set I tested, silver-red. The Pants have removable knee and hip armour and come in two colours (silver or black), and are available in short, standard and tall leg lengths. Be careful when ordering over the Internet without trying gear on; Alex had to order a different size of pants when her first pair weren’t a good fit. I have what’s deemed as the “hourglass” figure. I have a small waist but I have hips – for better or for worse :). According to the sizing chart, I should have been a size 38 in the pants, but I upped my size to 40 since the pants seem to be cut very straight. I was glad I did as there’s little to no wiggle room in the hips UNLESS I take out the removable hip protection, which I had no intention of doing. 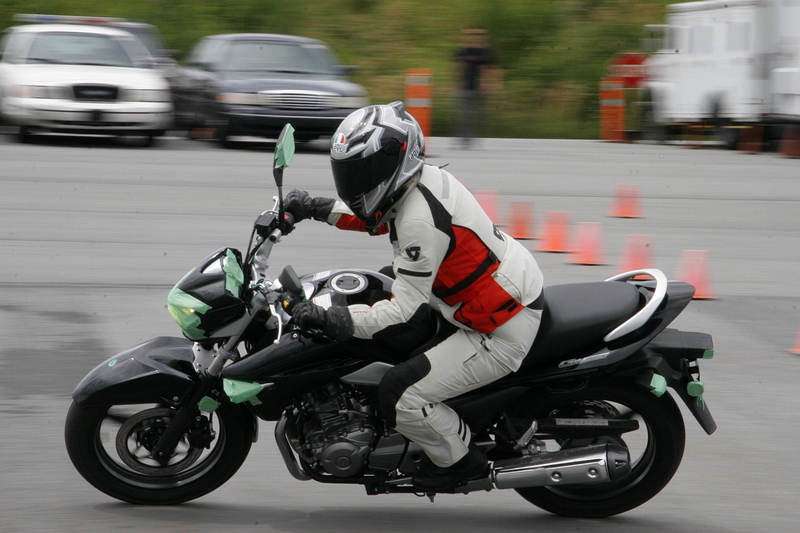 The extra room also allowed me to move a bit freer in the pants, meaning it was easier to throw a leg over the bike. For up top, I chose a size 38 jacket. Even though it’s smaller than the pants, the two of them still zip up very nicely together, which then solves the gaping waistline issue. I will point out that the collar in the jacket is quite high. That’s a two-fold blessing/curse– it keeps the rain from trickling down your back but if you’re on a bike that requires some sort of bending over, it did cut into my neck. 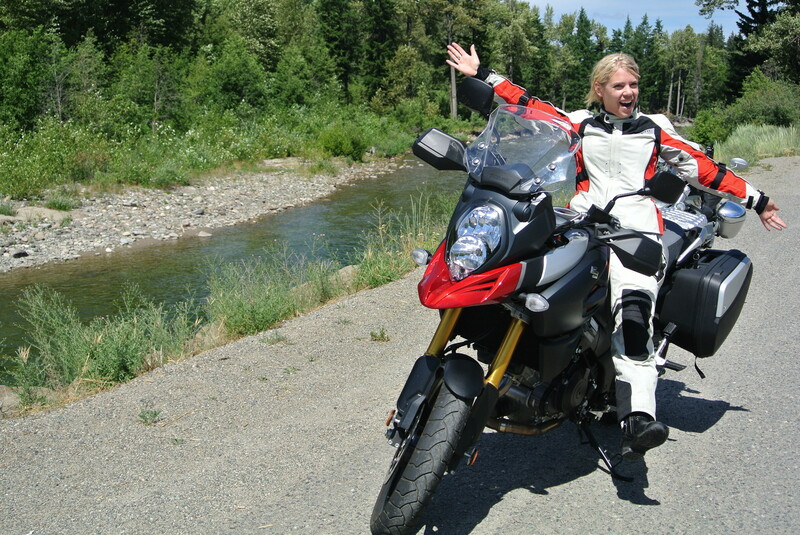 My first experience with it was on the Ducati Monster 1200 over the course of three days. By the end of it, I ended up with a hickey-like mark on my neck. Then again, I didn’t mind because it just reminded me of the fun I had making the mark. Oh to be young again! 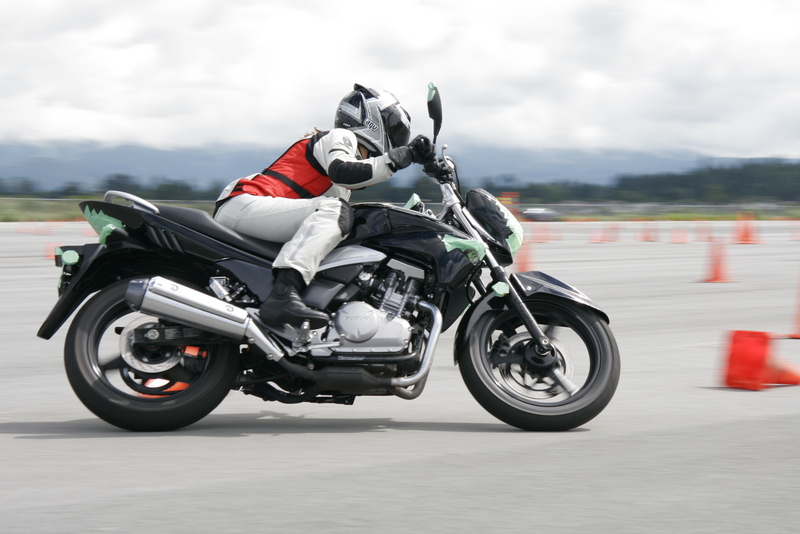 It would appear that the gear is designed with a more upright riding position in mind. Alex put the gear to the waterproofing test right from the start, on her Italian tour. Here, she puts a GW250 through its soggy paces during a downpour, while staying dry the whole time. My inaugural ride with the Sand jacket and pants certainly threw the gear into the deep end. It was early May in Italy, which you’d think would be sunny and gorgeous. Well, not on my motorcycle tour. It was 10 Celsius and pouring rain. With the waterproof and thermal inserts and a underlayer of a long sleeve top and leggings (I probably should have worn one more) I managed to stay relatively warm. Even with a day of riding in the rain at over 100km/h, when I arrived at my destination I was not wet at all. Since the waterproof layer is on the inside, the gear does feel heavy when wet and it did take the night to dry in front of a heater, but I wasn’t wet, even after hours in the rain. It did the job and did it well. This particular set of gear is designed for riding all year round and in above 30 Celsius weather I took out all the layers, opened all seven vents on the jacket and put a moisture-wicking base layer on. Not to mention my back protector. Needless to say, it was hot, but I never felt the suit suffocating me because it breathes really well. From what I experienced, the Sands jacket and pants are truly all-season gear. As mentioned, my introductory ride with the gear came in a cold and wet Italy in May. Then throughout the season, it came with me on long day-trips, when I rode on the back of a friend’s R1200GS, and any other time that didn’t require leathers. The Sand gear is supposed to be for all-season use, and by switching liners in and out, Alex found it worked well in the BC climate year-round. On the downside, I found that the front pockets on the jacket are not that functional. The zippers tend to bury themselves in the flaps so it’s hard to reach them especially with gloves on. The pockets themselves are not deep and don’t hold more than a pack of gum and maybe a debit card. I understand the look is all about being flush with the body, but I’d sacrifice a cinched waistline for pockets I have easy access to. The silver-red colour combination is fantastic. But because silver is the dominant colour, expect it to get dirty very quickly. Oh, and the bug splatter that you just love cleaning off your helmet’s visor? Yeah, you can see those clearly – guts and all – on the jacket and pants. Then again, the brighter colours make you more visible. And finally, having a straight-cut pant for my body shape doesn’t feel natural to me, but I got used to it. That’s not a fault of the pants, but a personal preference. There were a few minor hitches, but not many. Alex figures the gear is worth the price, especially because of its versatility. 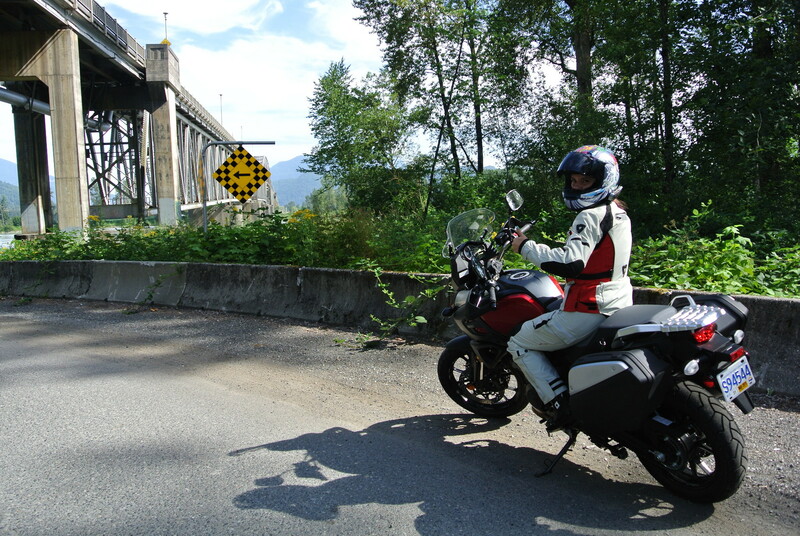 From what I estimate, I’ve put close to 10,000km on my REV’IT Sand jacket and pants over the year. All pieces are still intact, there isn’t any fraying or abrasion marks from the hell I’ve put them through. They got dirty in the process but that’s par for the course. I like that there are adjustment points on the jacket (at the waist), and adjustment points on the pants (at the knee and waist) to help the gear fit better in places that a lot of women might need more attention. Yes, it’s an investment, (approx. $449 for the jacket and $329 for the pants) but if you decided on this gear, you’ll likely be quite happy and satisfied with what it can do. good review, but in future it would be handy to see pictures of the gear instead of bikes and scenery used while reviewing the gear.